Rehabilitation Services – whether inpatient or outpatient – rely on engaging the patient to accomplish their goals and regain their mobility and independence. 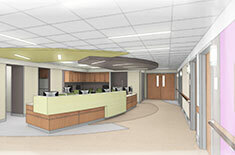 Designing with patient engagement in mind will go far in creating an encouraging care environment that inspires patients to succeed. 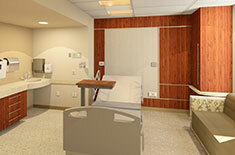 Corridors can be for more than getting from A to B, they can serve as both rehab and socialization spaces. On-unit physical therapy, when designed with patient-centered care tenets, can include space to involve family visits for both social and encouragement interactions. At Array, we strive to improve patient care outcomes through innovative, explorative designs that keep patients and caregivers as a priority.